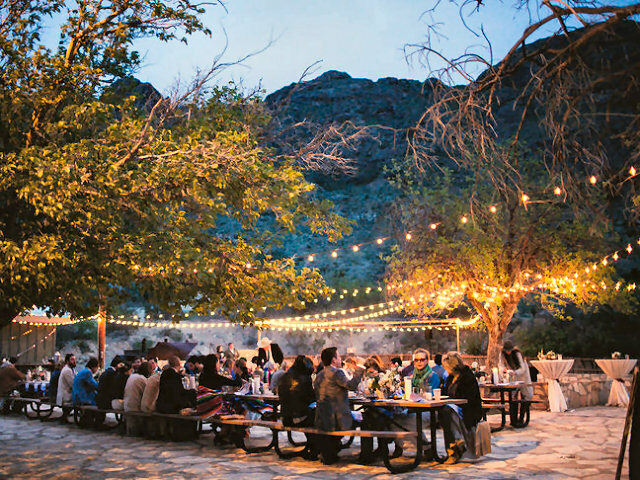 Terlingua Ranch: A Texas wedding venue with mountains by day, stars at night. If you are the blushing bride (or her meticulous wedding planner) looking for a naturally secluded and enchantingly romantic Texas wedding venue – a warm and sunny place to share your vows amidst spectacular mountain views, or bathed in the soft blue light of a full Terlingua moon, or staged beneath an awe-inspiring star-filled desert night sky, then plan to plight your troth in the panoramic splendor of the West Texas Big Bend and celebrate your nuptials at Terlingua Ranch Lodge! Terlingua Ranch Lodge is the ideal open-air venue for your dream West Texas wedding. 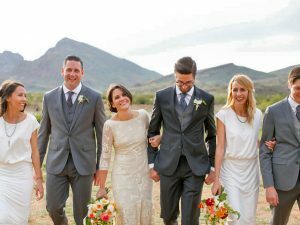 With 425 acres, a large stone patio with tables and grill, 32 cabin guest rooms, 20 RV sites with hookups, camping space galore plus ample free parking and our own airstrip, we can easily accommodate wedding parties of up to 50 people. 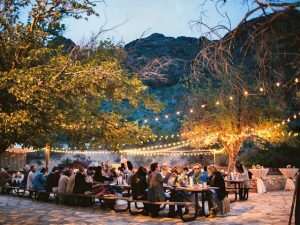 And nestled near the Christmas Mountains in a pristine part of the Chihuahuan Desert, you can expect warm, sunny days and crisp, clear nights year-round. 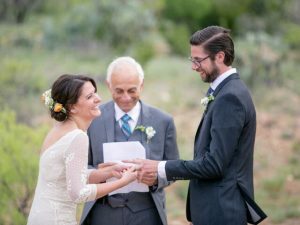 Should the weather be inclimate or your preference be indoors, we also have plenty of ceremony and celebration space in our Bad Rabbit Cafe and Bunkhouse Event Room. Stages with AC outlets are available indoors and out, so go ahead and hire that DJ or band for your rehearsal or reception and plan to party ’til midnight! 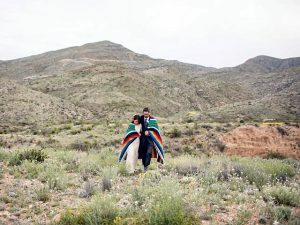 For as little as $12.95 per person (plus 7.75% tax and 20% gratuity) Terlingua Ranch Lodge will treat your wedding party to a sumptuous feast of your choice of barbecue, chicken, fajitas or shrimp with coffee, tea and water included. Service includes basic cafe plateware, so all you need to bring is your wedding cake! Visitors and guests can also enjoy a hearty breakfast, quick lunch or complete dinner at our Bad Rabbit Cafe, which boasts a full menu of mouth-watering down-home Texas cuisine and tantalizing Tex-Mex selections. Our restaurant offers beer by the bottle and wine by the glass. With deposit we can also provide beer by the keg and bar staff to serve it. And feel free to bring your own champagne or wine, as our corkage fees are only $5.00 and $10.00 respectively. You can bring can your own tables, linens, chairs, plates, silverware and glassware, and are free to make use of our walk-in cooler. Once you’ve scheduled your reservations with us, your caterers or other vendors can begin making deliveries of decorations and other materials and supplies as early as 7 days in advance. 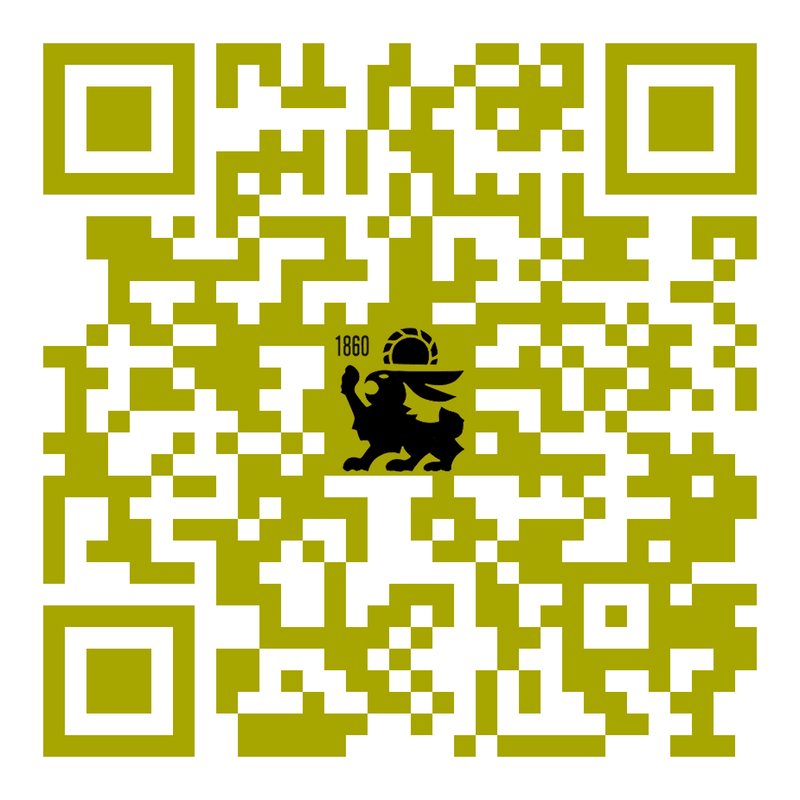 If you need assistance selecting caterers or vendors, we will be happy to provide recommendations. Setup can begin 8:00am on the morning of the event, and teardown must be complete by 12:00 midnight, unless you make alternative arrangements with us. We have 10 picnic tables on our patio that you can arrange and decorate as you please, with candles permitted and several power outlets available. Signage and other guest-direction aids are at your option. 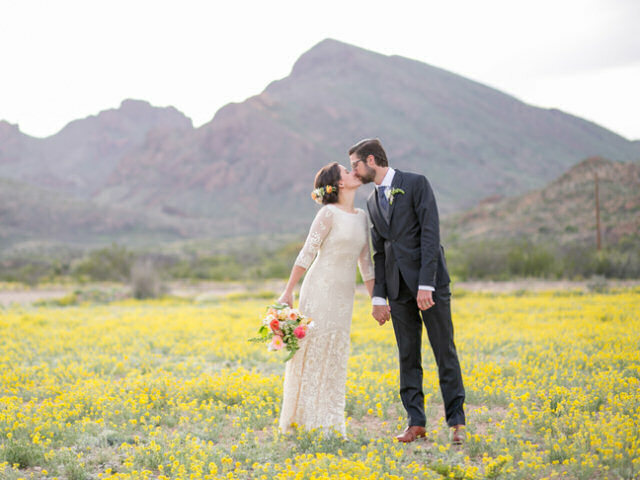 Terlingua Ranch Lodge carries standard property and casualty insurance, but you may want to consider your own wedding insurance as protection against the contingency of someone being injured and other risks. We will provide you with a 24/7 telephone number to call for on-site assistance in case of accident or emergency, but if you feel your party needs security personnel you will need to provide them. 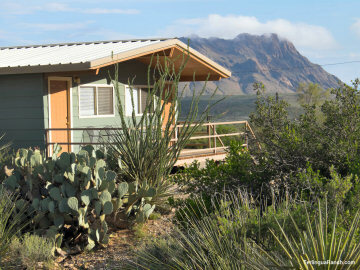 Our patio, cafe, bunkhouse and two restrooms are wheelchair-accessible, but you should anticipate the special needs of any guests with mobility issues. 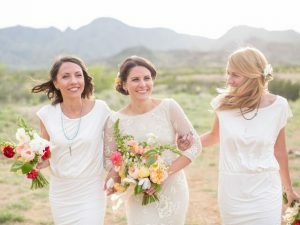 Also, we can provide guidance and direction but not staffing for on-site coordination or other logistical services specific to your event. 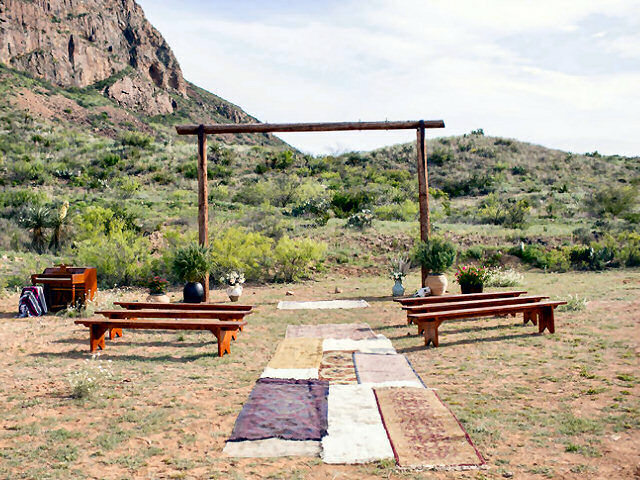 For questions and to schedule your wedding events please give us a call at 432-371-3146. Aside from Spring Break, Hunting Season, Chili Cook-off and New Years, our wedding venues are available for reservation year-round. Daily rental rates are $100.00 for our Patio ($50.00 for POATRI members) – or $100.00 for our Bunkhouse ($50.00 for POATRI members) in case of inclement weather. The ceremony area is complimentary either way. 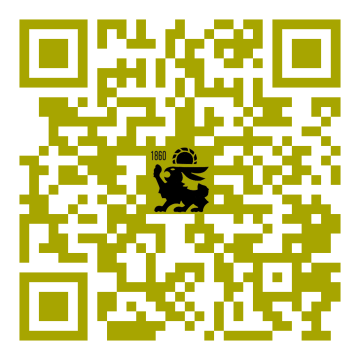 A 50% deposit is required with reservation. Cancellation 60 or more days prior to reservation date entitles you to a full refund, 59-30 days prior a 50% refund, and less than 30 days prior no refund. 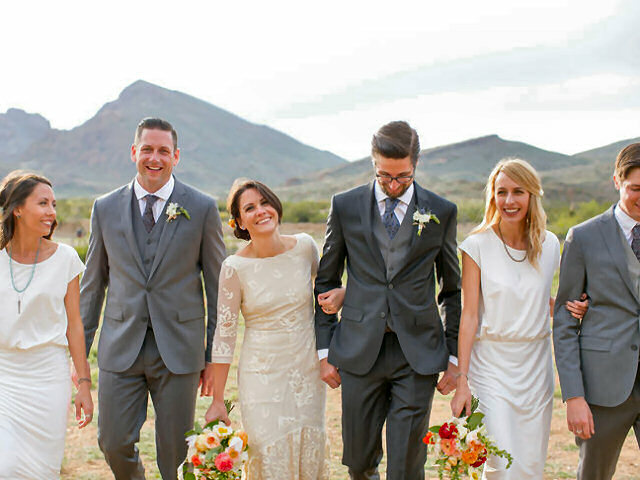 Wedding parties reserving 4 or more cabin guest rooms per night receive a 25% discount. 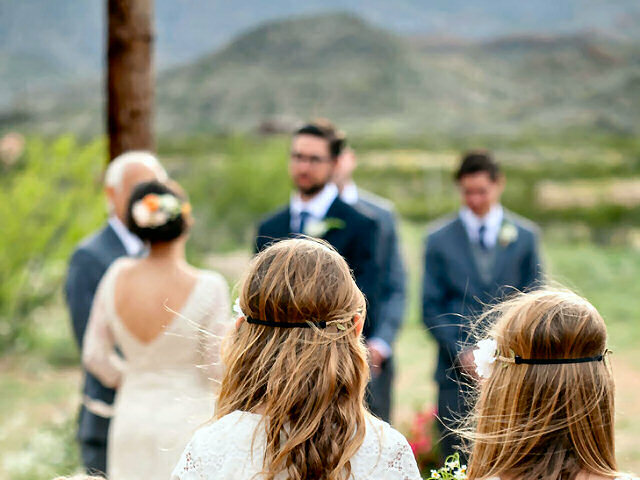 To schedule your dream wedding please download our wedding info flyer and then contact us today!